Hard to believe that Amar Akbar Antony is Nadirshah's directorial debut. 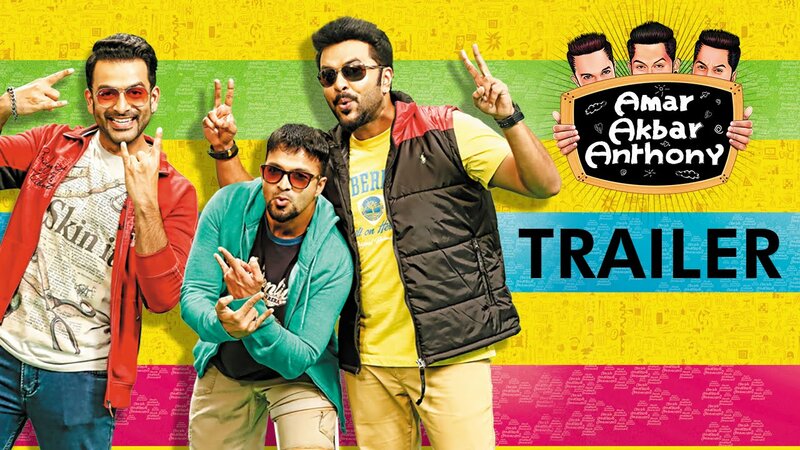 Like a seasoned director, Nadirshah brings together the most popular 'poster boys' of Malayalam cinema - Prithviraj, Jayasurya and Indrajith - in a well-paced interesting comedy thriller. I liked the scene where the guys get drunk and they talk about how women are 'heartless' and men are all 'hearts.' Their versions of heartbreaks gives you a different dimension to how men feel about heartbreaks and break-ups. And yes, Nadirshah pulls it off almost effortlessly, getting many nuances right, especially in music and cinematography. Director Nadirshah has also tapped into remarkable talent while portraying and bringing out the best in 'side characters' especially KPAC Lalitha, Srinda Ashab, Baby Meenakshi and Kalabhavan Shajohn whose performance was both touching and impressive as Jadayu Sabu. Ramesh Pisharody as 'Unni' is also good. Oh, there is the reckless, 'confident' biker Asif Ali too! He is the narrator, after all! When the story steers from a bunch of guys whose dream is to visit Pattaya by pooling in their savings to the issue of child abuse, the impact is felt. That people need to observe their surroundings more responsibly and be prompt to report when things seem amiss is the key thrust of the script. Ignoring child abuse thinking that it is someone else's problem won't help the society to move forward in tackling the issue. However, the concept of mob justice is hard to accept too though it makes sense for the public to be told to react promptly without being indifferent. I was impressed by the nuances that Nadirshah struck all the right notes and nuances in music, given that he has always demonstrated a passion for scaling new heights and trends in Malayalam songs right from his TV show days. For instance, the song which shows Prithviraj teasing girls has been sung by Vijay Yeshudas, reminding us of a similar once-popular song 'Maaney madhura karimbe' sung by Dr. KJ Yeshudas for a Mammootty starrer some decades ago. The other song 'Premamennal' is a superhit - the lyrics, the way it has been sung and how the actors have spiced it up with their glamor quotient. However, the most touching song was 'Yenno Njaaanende' by Baby Sreya. It was simple but soul-stirring. Hats off to Sujit Vassudev who not only made us proud by capturing some rare and scenic vignettes of beautiful Kochi. I am delighted that Sujit Vassudev also appeared in a cameo in this movie as the celebrity cinematographer who orders for pizza delivery at home! And what a gorgeous home, it is! We Malayalis love such cameos, don't we? So, friends, go watch this movie in the theaters! And give a round of applause to Nadirshah! I’m From Tamil Nadu, I like Malayalam Movies very much, in contrast I heard many Malayalam people like VIJAY, AJITH, SURYA, ALLU ARJUN. Tollywood is completely opposite to molly wood, whereas kolly wood is mixture of both the tolly wood and molly wood. Movies Made by Malayalam Industries are heart warming and life oriented, where you can at least learn something for your Life. I wish People from Malayalam film industry release their movies in Tamil with subtitles so that it will reach wider audience. Because artistic work should reach more people in the world. I used to read all the latest Kerala News in Malayalam From this site, check it , would be useful.